Fu Dao Le is a Chinese-themed slot game from Bally Technologies, based in Las Vegas, Nevada. Bally’s games have long been a familiar sight at land-based casinos all over the United States. Now, you can also find them at online casinos. Fu Dao Le roughly translates to “Fortune Has Arrived” in Mandarin. The slot goes all-out on this theme, with traditional music and iconography from the East Asian country. In terms of gameplay, it offers five reels and uses the “243-ways-to-win” system that is now commonly used by slots developers. 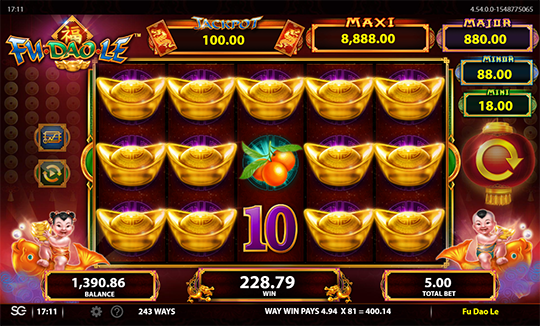 Fu Dao Le is a bright and golden slot with a heavy Chinese theme. The backing music is a traditional Chinese score that is enjoyable without being too innovative. However, it does cut out after every spin (unless you are on auto spin), which is a bit jarring. The music it plays when you win is worth touching on, though, with its cheerful jingling adding to the atmosphere of a payout. The overall graphical theme is hardly unique but interesting enough. The spinning reel symbols are smoothly animated and aesthetically pleasing. They include Chinese lanterns, mandarins, the standard playing card symbols, and a baby riding a carp. There are also mystery reel sections, where parts of each reel are covered up until they stop spinning. This certainly adds some extra excitement to the game as you don’t know what you’ve pulled until the last second. Before moving on, we feel obligated to point out one feature of this title. The bonus symbols are called a “wonus.” Some players might find this culturally insensitive given the theme of the rest of the game. Fu Dao Le uses the 243-ways-to-win system. This means there are no lines. Instead, any combination of three or more matching symbols, going across three reels, will trigger a prize. The exact position of the symbols on the reel doesn’t matter. This makes it easier for you to understand what is required for a win but also eliminates the possibility of betting on varying numbers of lines. Each symbol has three different payout rates depending on whether you matched three, four, or five symbols. The top standard-reel wins go as high as $88 per five winning symbols. Up to three sets of symbols can win at once. The top prize Fu Dao Le will pay out at once is $250,000. There’s no option to enter a custom bet that goes in between these numbers. Fu Dao Le’s auto spin feature is one of the biggest plus points, with several options for personalization. You can spin in groups of five, 25, 50, or 100, and you can decide if you want to stop at a big win or at a certain point of losses. Lastly, the return-to-player (RTP) sits at 96%, which is about the industry average and certainly not the highest you will find. There are two ways to win a jackpot in Fu Dao Le. The first is by pulling both the red dragon envelopes that appear on reels one and five. Most of the time, these will come with a marking of one of the other symbols in their bottom corner. In that case, pulling both envelopes will award a prize as if you’ve pulled five of their respective symbols. However, should either one of your red dragon envelopes come up with a jackpot mark, you’ll win an instant 20x your stake – that’s up to $1,780. The second way to win a jackpot is through Fu Dao Le’s only bonus round. Pull the clump of three wilds that appears on reel three to potentially unlock the bonus round on top of any other prizes won on that spin. The chance of entering the jackpot round goes up with the size of your total bet, although Bally does not state exactly how this works. Should you get lucky, a scroll-like screen will pop up with 15 hovering coins. None of the jackpots on Fu Dao Le are particularly huge, especially compared to the big-money progressive jackpots by Microgaming or other competitors. As mentioned, pulling three wild symbols in a clump on reel three offers you access to the jackpot round. Wild symbols in Fu Dao Le function as the usual stand-ins for any other symbol when making a winning combo. Additionally, wild symbols double or triple your payout on any win when two or more (respectively) are pulled as part of it. Apart from the wild symbols and the red dragon envelopes, there’s one more scatter symbol in this game – the ‘wonus’ symbol. Pull three of these questionably-titled symbols to trigger eight rounds of free spins, as well as a prize of 2x your total bet. You can pull three more during your free spins to extend the free play. Also, each individual ‘wonus’ symbol that appears on reel five during the free spins period extends your run by one more spin. Unless you’re counting the free spins, there’s only one real bonus round in Fu Dao Le – the jackpot round (triggered by three clumped wilds) discussed above. This title is for low-rolling, penny-slots players who have an interest in Chinese aesthetics and want a reasonable RTP. Fans of Mulan or other Western representations of East Asian culture will be happy here. The slot’s gameplay is enjoyable and removes any confusion about lines, which could be attractive for some players. However, those looking for big-money jackpots or very high maximum bets may want to look elsewhere. Fu Dao Le may not be for everyone due to its cultural insensitivity. The depictions of Chinese babies are interesting, to say the least, as are the ‘wonus’ symbols. We’ll let you decide on that one. If you weren’t convinced by Fu Dao Le but still want some Chinese-themed slots action, then Bally has you covered. Heavenly Riches and Spirit Guide Panda have similar themes, music, and symbols, such as firecrackers and yin-yang signs. Unlike Fu Dao Le, both of these titles let you customize your paylines, with 40 available on Heavenly Riches and 80 on Spirit Guide Panda. The 243-ways-to-win system: This different approach to a slots game will certainly draw in some players as it is incredibly easy to follow. You can easily see as soon as a win is coming up, but some excitement is added by the mystery sections of the reels. Fully customizable auto spins: This feature is always great to see and is even more useful on a low-to-medium-rolling title like Fu Dao Le. Two ways to hit jackpots: Having two separate jackpots – one scaling and one fixed – was a nice touch. For reference, we pulled the dragon envelope jackpot twice in about an hour or so of playtesting, but we didn’t hit the bonus round. Only one bonus round: In today’s competitive market, only one bonus round isn’t enough to keep up with the big-budget titles at the top of the pack. There were some attempts from Bally to keep things more interesting, but we would have appreciated another special or bonus round. Not much for super high-rollers: The $88 maximum bet per spin may not be too low for many, but it won’t be high enough to keep the highest-budget players engaged for very long. Questionable names and imagery: Calling your bonus icon in a Chinese-themed game ‘wonus’ was always going to be controversial, which could have easily been avoided by choosing a more creative or a more standard idea for their bonus symbol. Graphics and design: 3/5 – The game runs smoothly and is aesthetically pleasing, with some nice animations and features. On the other hand, there are a few snags (such as the removal of lines, or the single bonus round) that stopped us from rating Fu Dao Le any higher. Sound effects: 2.5/5 – The music is passable, and the fireworks and other sound effects that accompany wins are of good audio quality. However, Bally hasn’t broken the mold in any way with their sound design on this one. Jackpot value: 2.5/5 – While it is interesting that there are two routes to a win, neither of the jackpots goes higher than $9000. Fu Dao Le can’t lay claim to the biggest jackpot draws in the business. Replay value: 3/5 – This title’s mechanics were enjoyable overall, and the 243-ways-to-win system is always fun. However, there were one too many letdowns for us to fully recommend this game. There are better slots (even from Bally) out on the market.